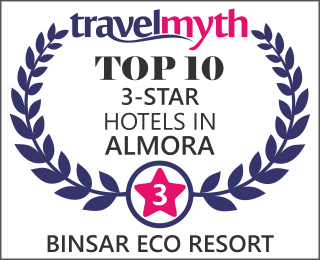 Binsar Eco Resort warmly extend our invitation to come and enjoy a beautiful property situated 13Km above scenic and historical town of Almora surrounded by virgin jungle consisting of deodar, oak, and pine trees with magnificent view of snow peaks of Majestic Himalayas. We have 06 cottages and a resort with 26 Rooms with all modern facilities & amenities. Binsar Eco Resort located at Deenapani near Binsar Sanctuary, with stunning Himalayan, Valley and forest views, lies just 13 km from Almora. Binsar is god gift for Almora place there are so many specialities related to nature beauty what is surrounded by Himalaya incredible forest and memorable weather /climate. Where we can enjoy outing tour package Events farewell conference and Yoga & meditation activity. Binsar eco resort overlook most spectacular valley and snow clad mountain views. And a big hall like 60×30 fit for your Meditation & Yoga, farewell ,events conference where are Big windows open to snow-capped. 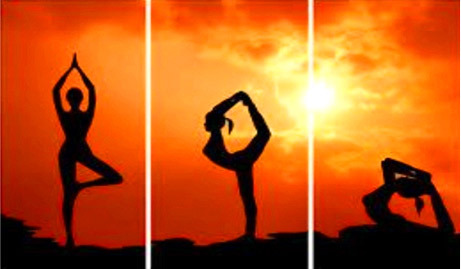 We know that is not sufficient for different activities related to Yoga & meditation in same place. That’s why Binsar Eco resort is also provide four open (space) lawns for the Yoga & meditation with the fresh air & sun shining light early in the morning for our future health saving our breaths. And we can make a memorable moment in Binsar Eco resort Deenapani Almora of our life We have complete setup for the Yoga and meditation ..
Kriya Yoga is a meditation technique which takes us inside to Silence, to a level of no conflict. The techniques are based on the breath, the awareness and the energy centers (chakras) in the spine – developed and tested through thousands of years, based on a rich and ancient tradition. The techniques are simple and effective. In a retreat one receives inititation in the 1st Kriya which comprises of six techniques. There are further higher Kriyas, up to the 7th, which is subsequently given according to individual’s preparedness through regular practice. Paramahansa Yogananda describes Kriya Yoga as an excellent tool to enhance human evolution and to attain Self Realization in his bestselling book “Autobiography of a Yogi”. Silence is planted in our hearts like the seeds of the wild flowers are planted in the soil. Silence and activity are two sides of the same issue. A stable and peaceful mind is blessed with new thoughts that support development. Silence gives rise to variety in life, integrated into and at the same time beyond time and space. There exist levels of Silence, which we can experience in deep meditation. The mind encounters the source of creation where love, infinity, stability and creativity rule. “When the mind is bright, then the whole world is bright. When the mind is dark, then the whole world is dark.” Human life is first of all an inner journey. When Silence penetrates the consciousness, we experience who we are and are guided by the true Master, the Self. Faith includes doubt. That is, faith must be founded on certainty, in an inner state of non-duality. Nothing seems to be impossible for Life. The manifested process of the creation proves Life ́s inconceivable intelligence and creativity. We might find inspiration about the highest in the scriptures. The Bible says that the kingdom is inside us. That tells us where the state of harmony exists. The Bible also says that “The Father and the Son are One”, a state that implies unification in the consciousness. The experience of the inner kingdom gives certainty and peace of mind. We cannot quench our thirst by a description of water or by the word “water”. We have to drink ourselves. Words may inspire us, but words are not enough. The experience of “the kingdom inside us” is the real meditation. That’s why we are think about our guest. We can completely secure our future by yoga and meditation peaks, offer commanding view of snow-clad range. The hotel Basks in the Sun throughout the day, making the guest feel Comfortable and warm. Most of the rooms offer excellent View of the Snow clad Mountain Ranges, Forest & valley Views. It has carpeted and spacious rooms with balconies Offering grand view of the valley and Surrounded with Oak Forest, away from city crowd and noise. For visitors there are superb locations for relaxing and sight-seeing in the lap of nature. Color T.V. with Multi channels. Scenic Terrace & big hall for Relaxation, Yoga & Meditation. Heaters & Warm blowers to keep your room warm in winters* on demand*. Indoor Games Carom, Chess, Pool Table Tennis .